Here, near where I am staying in Israel, the wild mustard is putting on quite a display. Last Friday I took a trip to some wildflower fields just outside of Beit Shemesh, which is located a little west of Jerusalem in the foothills of the Judean mountains. 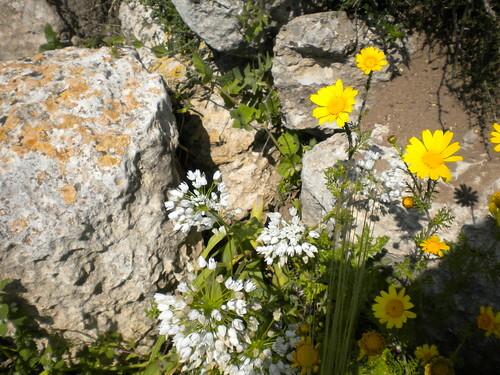 The hills were covered with yellow daisies, broken up by patches of all kinds of other flowers. Take a look at some of them. 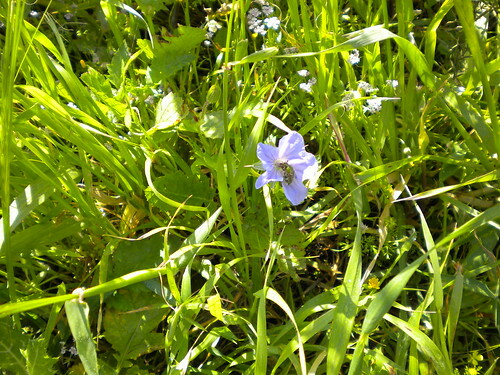 I did my best to identify them using an online wildflower guide an a small book of Israel wildflowers. 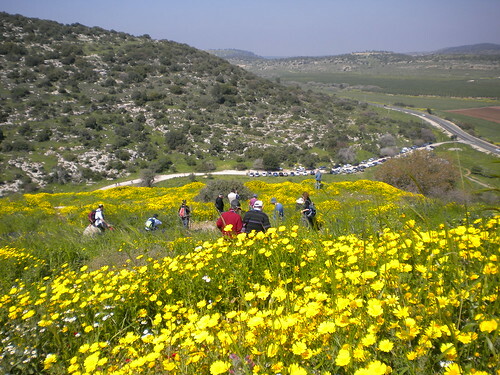 The first picture is the vista of the hills with yellow flowers and lots of people near the bottom of the hill who had come to see the flowers. 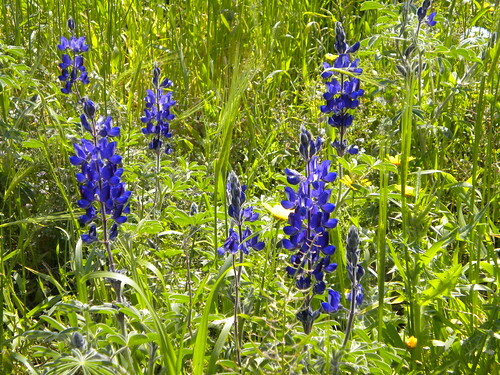 The yellow of the Crown Daisies (Chrysanthemum coronarium) was punctuated by vivid blue of the Blue Lupine (Lupinus pilosis). Bright red poppies also peeked through the yellow carpet. I think the Corn Poppy (Papaver subpiriforme) might be the right one. There were several kinds in the field, and the guide listed quite a few different species of poppy, so this is my best guess. 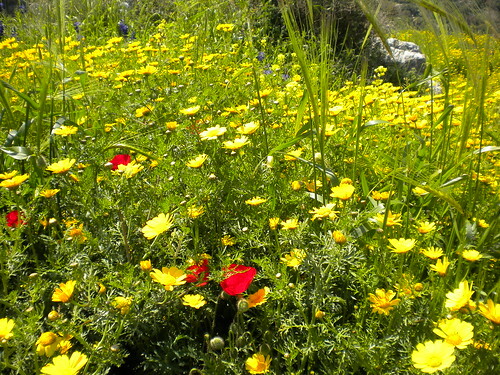 In other wildflower fields in Israel, the poppies predominate and the entire hill appears red. 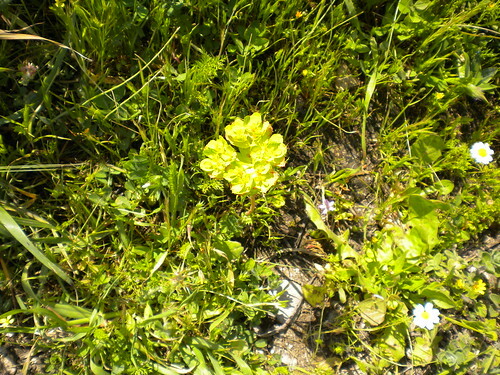 There are numerous wild euphorbia here and the Euphorbia chamaepeplus is my best attempt at identifying the one I saw nestled here and there among the other wildflowers. 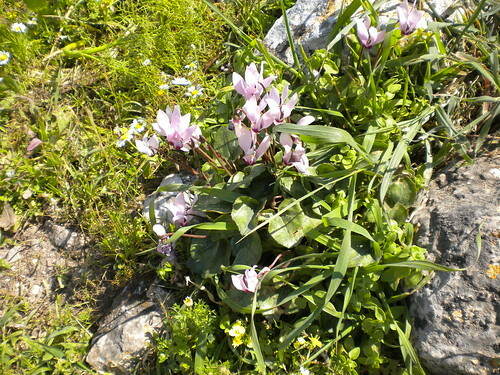 One of Israel’s favorite flowers is the Persian Cyclamen (Cyclamen persicum) which you will see all over the hills from about January through April or May. There are songs written about them. I have even seen them from the highway while traveling. There were lots in this field. I found this amazing star shaped flower, which I initially thought was some kind of penstemon. I found an ID for what I now think is the Echium judaeum . 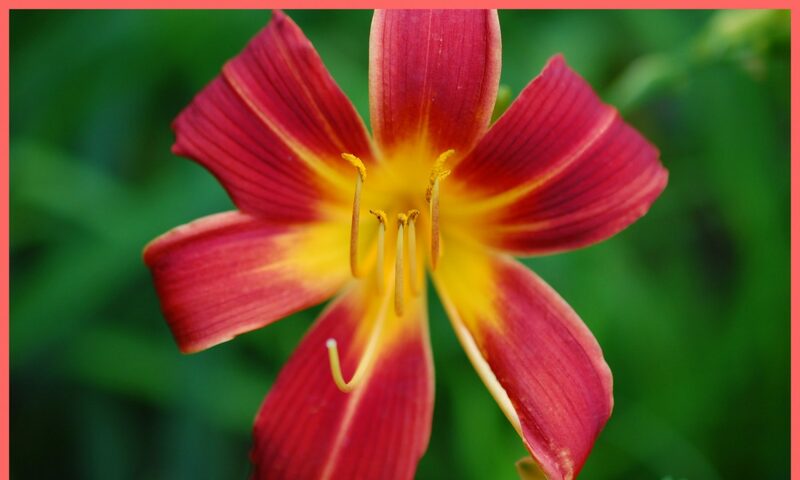 I loved this flower and there were a lot of them. 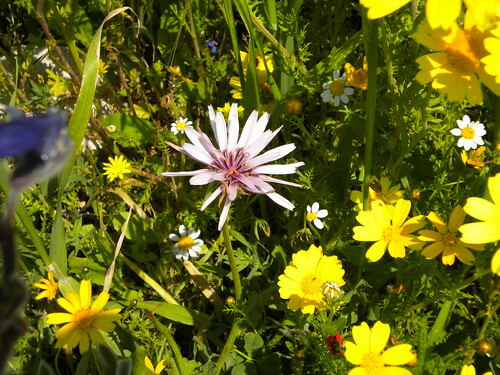 I hope that you have enjoyed the lovely wildflowers that were in a perfect mosaic in some wildflower fields in the Judean Hills of Israel near Beit Shemesh. There were a lot more wildflowers to take pictures of such as artemisia, chamomile and mullain, but these were the ones that stood out. 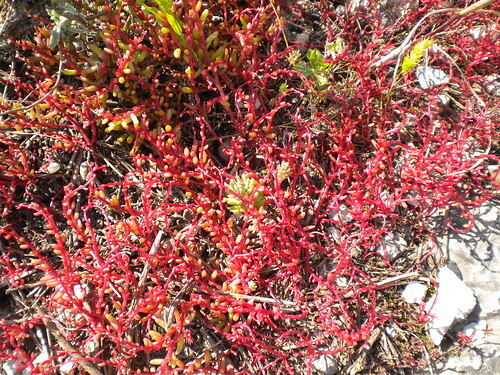 I tried my best to identify them, but if anyone has a better ID, let me know. This is the prime wildflower season after all. Thanks to Dear Little Red House for letting me share these.